Following the success of the website and branding projects for our clients dbg and CloudXL, Ultimate were the lucky agency choosen to redesign and develop Synova Capital’s website. Synova capital are a private equity company with a portfolio of clients including dbg and CloudXL who Ultimate were commisioned to rebrand. 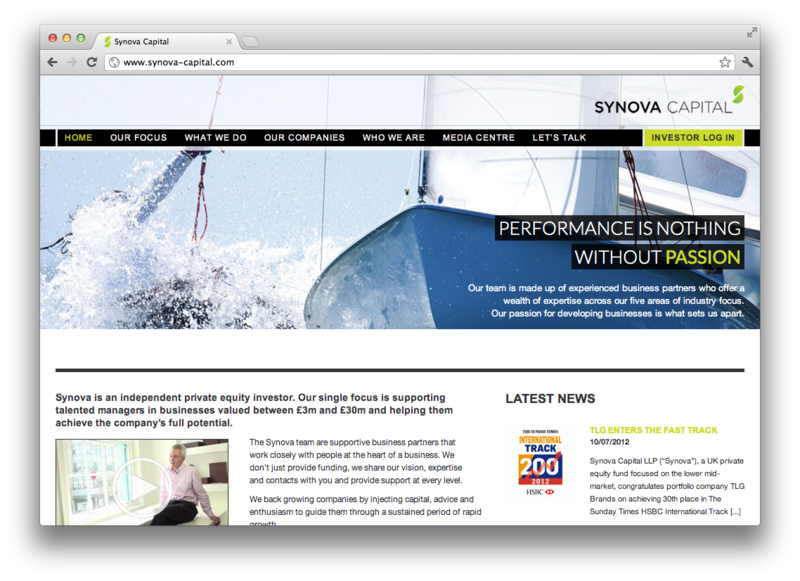 The brief for Synova’s website was all about creating a dynamic and professional design. The look and feel of the website needed to be fresh, simple and engaging. A latest new feed and real time social media feeds ensure that the homepage is kept updated and fresh to encourage more visits and engage the visitior, creating a valuable tool for both visitors and Synova. The addition of videos throughout the site are key to communicating the messages of previous clients and how they have found the experience of working with Synova, essentially an interactive testimonial. The website has been built with it’s own Content Management System (CMS) which provides Synova with an intuitive and scalable platform from which they can grow and develop the site over the coming years. It has been a pleasure to work on this project and look forward to working with more clients like this.